Last weekend’s temperatures soared into the 80’s, and then were followed by some nice drenching rain. Good mushroom conditions – except for the fact that it’s early April here in northern Illinois. We’re still a few weeks away from morel season. 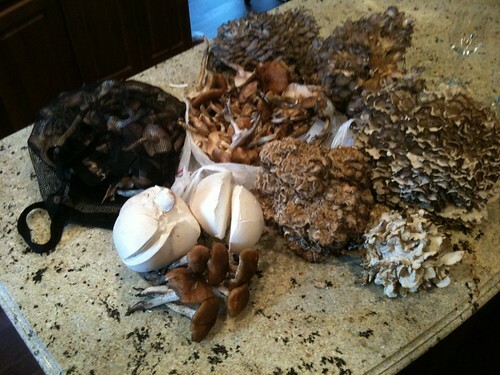 I brought home four hens-of-the-woods, two giant puffballs and scores of honey mushrooms. It was a truly magical day. 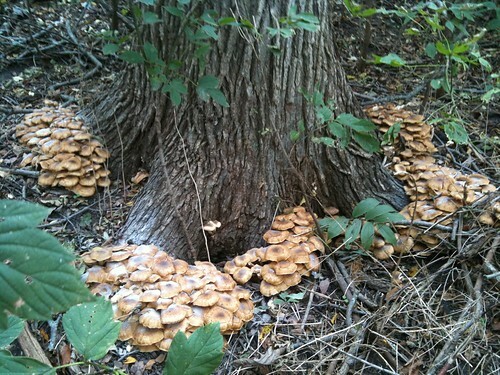 The honey mushrooms were clustered by the multiple dozens around an oak tree, and next to them were three hens of the woods. I already had found another hen, which I almost dropped in excitement when I saw the hens and honeys arrayed in front of me. I literally gathered what I could carry. Both are perennial, and I know where their tree is. More will be found there this fall. I staggered out of the woods with my load, and filled up the back seat of my car. But the riches didn’t end there. 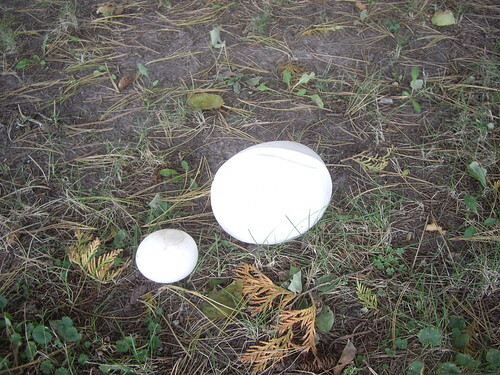 Driving down the country highway, I spotted giant puffballs growing under trees by the road. I swung into the driveway, and knocked at the door. The woman who answered was very interested when I told her that I suspected that she had some delicious giant puffballs in her yard, and accepted my offer to identify them. I cut one open, and it was pure white inside, with zero greening. They were perfect puffballs, ready to eat. Uncertain about eating mushrooms found in her hard, she offered them to me. I accepted but took only two, leaving the third to (hopefully) reproduce. I am sure that this wildly successful day was an anomoly. I’m trying not to let my expectations become too unrealistic. Hope in the spring. There’s a reason for that old adage.